Resolving the Stateside bench's longest-standing vacancy, at Roman Noon today the Pope named Msgr Edward Weisenburger, 51, vicar-general of Oklahoma City and rector of its Cathedral of Our Lady of Perpetual Help, as bishop of Salina. In the 50,000-member diocese that comprises Northwest Kansas, the bishop-elect succeeds his boss until today, now Archbishop Paul Coakley, who was promoted to Sooner Country in December 2010. Born in western Illinois and transplanted to Oklahoma as a boy, Weisenburger studied at Missouri's Conception Seminary College and the recently-closed American College Louvain before his ordination in 1987. After returning from advanced studies in canon law at Ottawa's University of St Paul, he was named vice-chancellor of the archdiocese and, in the wake of the 1995 bombing of the city's Murrah Federal Building, served as an on-site chaplain for relief workers and the families of the lost and injured. A year later, the now retired Archbishop Eusebius Beltran tapped Weisenburger to serve as his vicar-general. Following a nearly four-decade drought of Oklahomans named to the episcopacy, the Salina appointee is the second Sooner to become a bishop in recent years, following Little Rock's Bishop Anthony Taylor, a longtime OKC pastor who was tapped for the Arkansas post in April 2008. 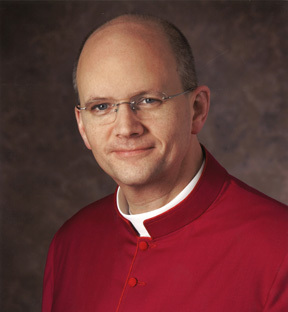 In keeping with the norms of the canons, the bishop-elect must be ordained and installed in his new charge within four months of this morning's appointment. This August, the Salina church -- originally founded at Concordia -- marks the 125th anniversary of its establishment. With today's move, eight Stateside Latin-church sees -- including, for the first time in 20 years, a trio of archdioceses -- remain vacant, and an additional eight are led by (arch)bishops serving past the retirement age of 75.